Die Veneris, 23 Septembris, 1642. Lord Lieut. of Ireland, &c.
Reward to Soldiers at Hull. Presenting Treaty to the King. Mr. Cambell declares he will lend Five hundred Pounds for Two Years, gratis, for the Service of the King, Parliament, &c.
Sir Christ. Wray sends Word, That Sir Robert Crane had delivered unto his Hands, for the Use of the Parliament, Four Horses, which he had formerly subscribed. It is Ordered, That, in regard that these Collections cannot be entered upon by another, but with inconvenience to the Service, that the Arrears shall be paid unto the said Mr. White, and by him be returned to the Treasurers for those Monies, notwithstanding that he is to leave the Office of Sheriffalty at the Time aforesaid. Resolved, upon the Question, That Mr. Bushell, sent up from Sir Nevile Poole, be forthwith committed Prisoner to the Gatehouse, to remain during the Pleasure of the House: And that the Four Men that brought him up, be forthwith discharged of him. Ordered, That Mr. Jo. Dawes shall have Privilege of Parliament until Allholland-tide next (it being granted by the Consent of the advancing Creditors); that he may in the mean time take Care for the Satisfying of the said Creditors by assigning over the Statute; saving unto himself so much of the Land as may secure himself from the rest of the Creditors. Ordered, That the several Merchant Strangers residing in the Town and Pórt of Dover, who do owe any Money upon the Duty called Harbour-money; and, as the House is informed, are now removing into Flanders; do pay the said Monies so due, into the Hands of Sir Edw. Boyse and Sir Anth. Piercivall, for the Use of the Harbour there: And that the said Sir Edw. Boyse and Sir Anth. Piercivall do call for the said out of the said Strangers Hands; and cause the said Duty to be collected. It is Ordered, That he be forthwith discharged: And that he be injoined to make Acknowledgment of his Offence, and Recantation of the Words be spoke at Maidston, at the next Quarter Sessions. Ordered, That the humble Petition of Jo. Windebanke, Scholar of the University of Oxon, who was sent up a Prisoner, being taken in Arms against the Parliament, be referred to the Committee for the Defence of the Kingdom. 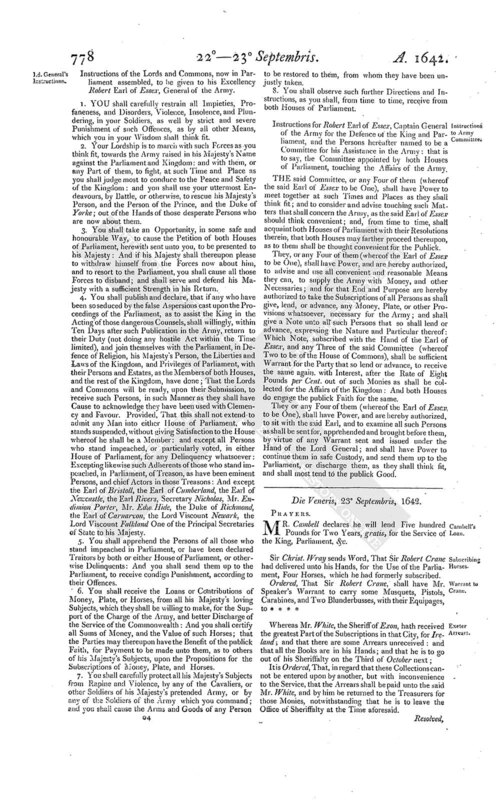 The humble Petition of divers of the Inhabitants of Hambleden in the County of Bucks; and divers Articles of dangerous Consequence, against Mr. Geo. Roberts their Minister; were this Day read. It was Resolved, upon the Question, That Mr. Geo. Roberts, Minister of Hambleden in the County of Bucks, be forthwith sent for, as a Delinquent, by the Serjeant at Arms attending on this House: And that the Petition, and Articles, and Examination of this Business, be referred to the Committee for Informations. A Letter from the Earl of Warwick, of the 19th of September, concerning a Winter Guard, was read. Mr. Greene likewise reported the state of the Navy with relation to a Winter Guard. Ordered, That Mr. Green do acquaint the Committee for the Defence of the Kingdom, with the Report this Day made by him, of the State of the Navy at Sea; and with the Proportions that are thought fit for a Winter Guard for the Coasts of England: And that they do take a speedy Consideration hereof, and return their Opinions to this House with Expedition. Resolved, upon the Question, That the Consideration of a Winter Guard for the Coasts of Ireland be referred to the Consideration of the Committee of Adventurers for Ireland: And they are required to take it into a speedy Consideration; and to return their Resolutions to the House with all Expedition. The House being informed, That the Soldiers received their Pay in light Monies, though they were returned hence in good Monies; the House hath Ordered, That it be referred to the Committee for Ireland Here, and to the Committee that is to go over into Ireland, to inquire through whose Hands the said Monies ...., and by whom they have been paid; that the Soldier may have Reparations for this Damage, and not be abused in their Pay for the future. Resolved, upon the Question, That the Twenty-and-odd thousand Pounds, the Remainder of the Twenty-eight thousand Pounds, formerly designed for Ireland, in Mr. Henleye's Hands, Deputy to Mr. Loftus, shall be forthwith sent to Bristol, from thence to be conveyed to Dublyn in Ireland, in English Money. Resolved, upon the Question, That the Committee of this House that are to go into Ireland, shall take Care, that this Sum, and all other sums which shall be sent over during their Abode there, be distributed in English Coin, to the Soldiers, in such Manner as shall most conduce to the present Service. Sir Wm. Armyn carried up to the Lords, the Declaration concerning the Soldiers Repair to their Rendezvous; and likewise the Consent of this House to the Amendments to the Scotts Treaty, returned from the Lords at a Conference long since. There were divers Letters read, from the Lord General; concerning the good Demeanor of the Army; and from Mr. Fienis and Colonel Browne, concerning some Attempts by them made upon the City of Worcester; and a Letter from the Lord Falkland, which was intercepted, being directed to a Lady of Quality; and likewise a Letter from Mr. Walth. Strickland, with some Advices from the States of Holland, concerning his Proceedings upon the Commands of both Houses of Parliament. Mr. Pym, Sir H. Mildmay, Mr. Holles, Mr. Pierrepointe, are appointed to prepare a Declaration to acknowledge the good Affections of the States of Holland to the Parliament. Resolved, upon the Question, That Sir Fred. Cornewallis shall be disabled to sit or continue any longer a Member of this House, during this Parliament; the House being ... . that he entertaineth and sendeth over Officers from Holland into England against the Parliament. The Lord Lieutenant of Ireland, being returned newly from the King, hath communicated divers Particulars to that House; which they desire to communicate to this House: And therefore the Lords do desire a present Conference, by Committees of both Houses, in the Painted Chamber, if it may stand with the Conveniency of this House. Answer returned by the same ....; That this House has considered their Lordships Message; and will give a present Meeting, as is desired. Sir H. Mildmay is appointed to go to the Lords, to acquaint their Lordships, That this House is resolved, upon some weighty Affairs, to meet this Afternoon, at Four of Clock; and to desire their Lordships to do the like, if it may stand with their Conveniency. Mr. Pym, Mr. Reynolds, Mr. Ro. Goodwyn, Sir Tho. Barrington, are appointed Reporters of this Conference. Sir H. Mildmay brings Answer, That the Lords will sit this Afternoon, at Four of Clock. Resolved, That Mr. Pelham and Mr. Alured be summoned forthwith to attend the Service of the House. Ordered, That it be referred to the Committee for the Defence of the Kingdom, to take Order, that the Twenty Shillings Per Man, promised to such as should do good Service, and deserve well at Hull, be paid unto them: For the Time when, is referred to the Committee. Resolved, That Sir Wm. Uvedale, a Member of the House, shall have Leave to repair into the Country, for Recovery of his Health. Ordered, That Mr. Robert Goodwyn do make an End of the Report this Afternoon, at Sitting of the House. It is this Day Ordered, by the House of Commons, That Sir David Watkins, Mr. Morice Tompson, Mr. George Henley, Captain Tho. Chamberlaine, Mr. Ric. Hill, Mr. Tho. Vincent, Captain Methold, Mr. Wm. Pennoyer, Mr. Stephen Beale, Mr. Ric. Wearing, Mr. Wm. Hawkins, or any Three of them, shall be authorized and desired to meet together, at such Times and Places as to them shall seem convenient; and to call before them such wellaffected Persons, as will forthwith bring in any Quantity of Victuals for the Soldiers in Ireland, or Clothing for them, as Woollen, Linen or Shoes; or any Quantity of Powder, Match, Bullet, Arms, Ammunition, or Ships for War, at reasonable Rates; taking for their Security an Ordinance of Parliament, to be satisfied out of the Rebels Lands proportionably, according to the several Quantities as the other Adventurers, by the Act of Parliament (the Adventurers in ready Money being first satisfied); or else to be paid in ready Money, Ten or Twelve Months after the Delivery of the Commodity: All which will be accounted a very good Service to the State: And those Gentlemen are desired, from time to time, to give an Account of their Proceedings herein, to the Committee for Irish Affairs. ORDERED, That H. Knollis Merchant, a Factor usually residing in Bourdeaux in France, shall have Mr. Speaker's Warrant to transport himself into France. Mr. Pym presented from the Committee, a Declaration to be sent into Holland, to the States of That Province; to acknowledge the Affections of That Province to the Peace of this Kingdom; and to return them Thanks: The which was read; and, by Vote upon the Question, assented unto; and carried up to the Lords by Mr. Pym. Ordered, That the Report concerning the Business for Ireland be taken into Consideration To-morrow Morning. Ordered, That the Lord Chief Justice Banks be desired to present unto his Majesty the Treaty for Scotland, in the same Manner as Secretary Nicholas * * * * . Ordered, That this Declaration be sent to Mr. Walth. 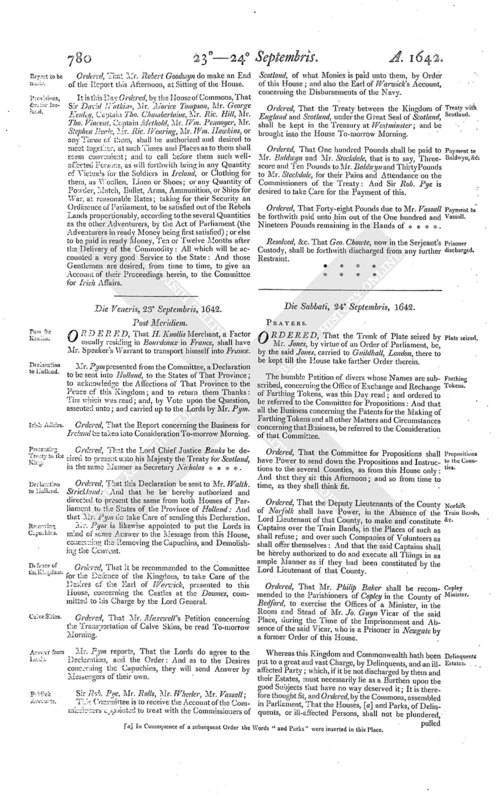 Strickland: And that he be hereby authorized and directed to present the same from both Houses of Parliament to the States of the Province of Holland: And that Mr. Pym do take Care of sending this Declaration. Mr. Pym is likewise appointed to put the Lords in mind of some Answer to the Message from this House, concerning the Removing the Capuchins, and Demolishing the Convent. Ordered, That it be recommended to the Committee for the Defence of the Kingdom, to take Care of the Desires of the Earl of Warwick, presented to this House, concerning the Castles at the Downes, committed to his Charge by the Lord General. Ordered, That Mr. Maxewell's Petition concerning the Transportation of Calve Skins, be read To-morrow Morning. Mr. Pym reports, That the Lords do agree to the Declaration, and the Order: And as to the Desires concerning the Capuchins, they will send Answer by Messengers of their own. Sir Rob. 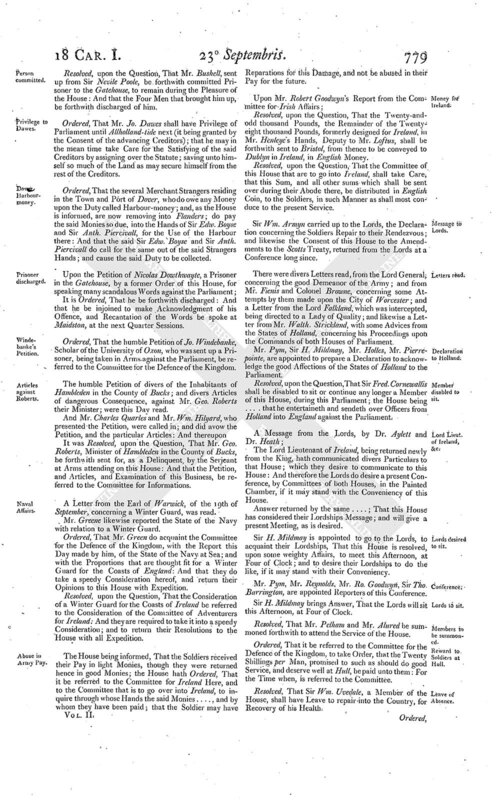 Pye, Mr. Rolls, Mr. Wheeler, Mr. Vassall; This Committee is to receive the Account of the Commissioners appointed to treat with the Commissioners of Scotland, of what Monies is paid unto them, by Order of this House; and also the Earl of Warwick's Account, concerning the Disbursements of the Navy. Ordered, That the Treaty between the Kingdom of England and Scotland, under the Great Seal of Scotland, shall be kept in the Treasury at Westminster; and be brought into the House To-morrow Morning. Ordered, That One hundred Pounds shall be paid to Mr. Baldwyn and Mr. Stockdale, that is to say, Three-score and Ten Pounds to Mr. Baldwyn and Thirty Pounds to Mr. Stokdale, for their Pains and Attendance on the Commissioners of the Treaty: And Sir Rob. Pye is desired to take Care for the Payment of this. Ordered, That Forty-eight Pounds due to Mr. Vassall be forthwith paid unto him out of the One hundred and Nineteen Pounds remaining in the Hands of * * * * . Resolved, &c. That Geo. Chowte, now in the Serjeant's Custody, shall be forthwith discharged from any further Restraint.